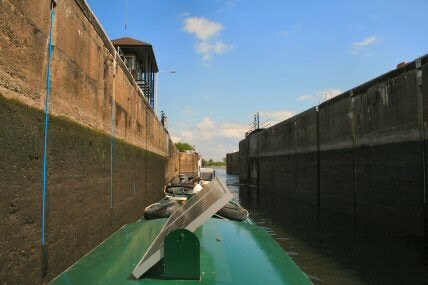 Having turned the boat to face the right way its into Cromwell Lock feeling rather insignificant. There is almost as much room astern of me as there is in front. 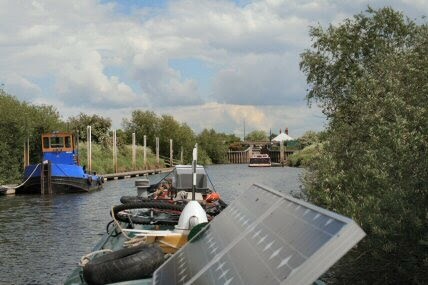 A mere 60 foot narrowboat is quite lost in here. There are wharfs along the Trent that were used to load gravel and the one at Besthorpe is still in use. Battlestone is almost finished loading so I put my foot down a bit to try and keep out of his way further along the river. One that is not in use is that of Carlton Wharf. There was at one time a ferry here too. There is evidence left behind with a Ferry Farm on both sides of the river. Other wharfs are totally derelict. 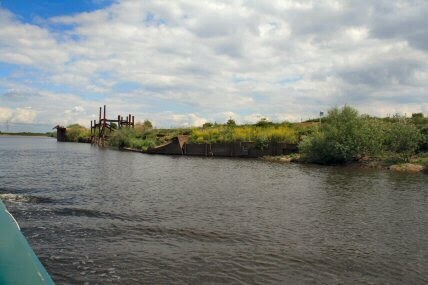 This one at Girton Gravel Wharf even has a few sunken barges next to it. 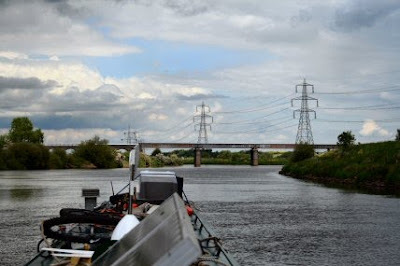 Shortly after the power station is Fledborough Viaduct. 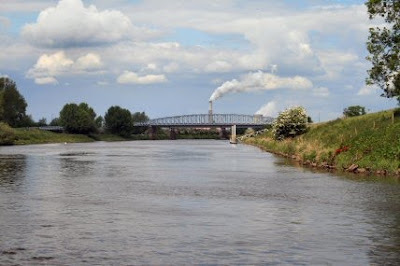 This railway bridge was use to transport coal to the power station at Drax I believe. There are a couple or three places to watch out for according to the guide. Two of these are sunk islands but don't worry that you might miss them and end up aground. They are marked with large yellow signs to keep to the left going downstream. The third item is Butler's Island which needs to be passed on the eastern side. It becomes obvious when you get near with a fence coming down into the water on the western side. 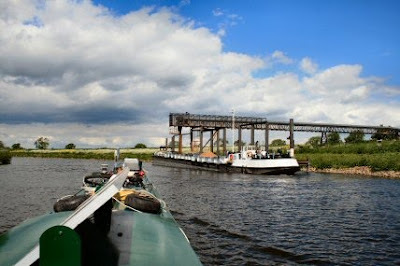 Getting near the end now as Dunham Toll Bridge comes into view. Dunham was notorious for flooding at one time. The flood banks put an end to the fairly regular occurrence of 10 foot of water in the house. Now I know I am back in Lincolnshire. 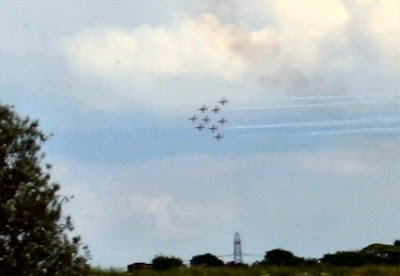 The Red Arrows are up doing the practise flights ready for the season of air shows around the world. Having been overtaken by the cruiser Jigsaw I have to wait a few minutes while he is locked up into Torksey and the chamber emptied for me. 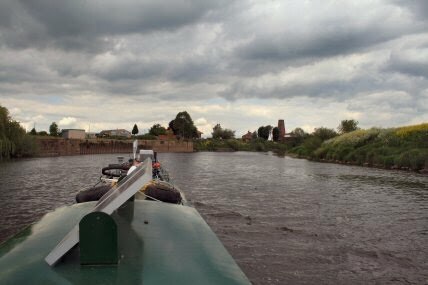 As I rounded the corner I heard the noise of an engine astern and I have managed to keep in front Battlestone as it takes a load of ballast down river. Much of the traffic has finish for the time being. The used to be half a dozen or more carriers making a trip or two every week but with the recession it is down to one boat. Thank goodness that's over. 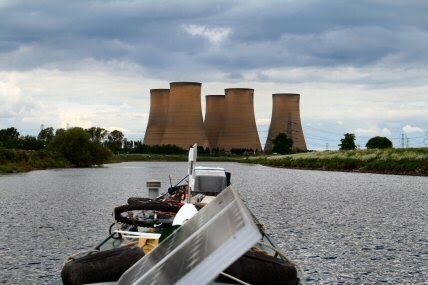 With just one person on a narrowboat it is impossible to travel and check out the annoying vibrations. 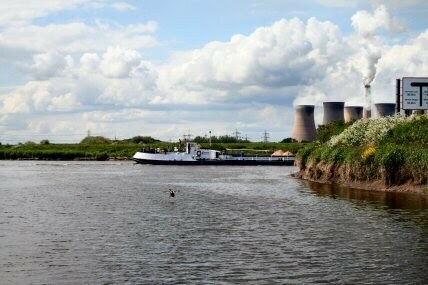 Peace and tranquillity inside Torksey and back on the canal. 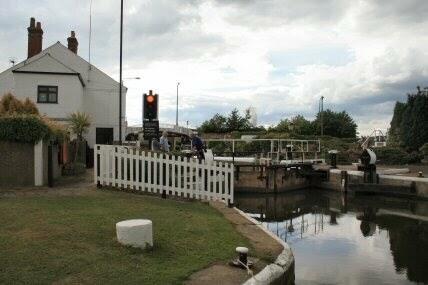 There do have some really very friendly lock keepers here. The one on duty today is ex BR and joined BW as a seasonal lock keeper. An ideal job after BR and its in-fighting. I have a very pleasant weekend in prospect. Abz phoned up yesterday and we were on the phone for over an hour while she planned out the program of events from Saturday to Monday. Biking, walking, DVD, DSi, shopping and baking are all lined up to be done. A visit to the arboretum on Sunday is a must with the weather looking to be good. The cafe there is very reasonable.